Much appreciated, please keep us posted! plants a must say is away forward in space for outerspace traval and prolongd stay on spacestations. Thanks for this report Mr Pettit. 1) “Mold takes over”. Interesting. Mold is NOT affected by the micro-gravity? Apparently fungi and other parasites survive much better than other plants then. 2) If the leaves are glued down,is it impossible to just take them apart? Maybe that would overcome the problem? Again thanks for this entry. I wish you the best. Are you growing under lights or Sun light? What a clever zucchini you are! And beautiful, too! I hope you and your new pigmat-mates become good friends. I watched as your garden passed over my garden this morning, as I have done many times before. My roses smiled and waved to give you encouragement, as does my gardener. We are all in awe of your pioneer spirit. Stay strong out there on the frontier. See you in the night sky! It seems that no one ever leaves comments here, which is a pity. I really enjoy your updates, and I doubt that I am alone. Thanks for being such an interesting person while spending your time on the station. My name is Matthew Baldwin and I am six years old. I am also growing a sunflower seed for school. I go to Sidemore first school in Bromsgrove in the Uk. I would be very pleased to hear how your sunflower gets on. My class has just finished learning about space and I found it very interesting. 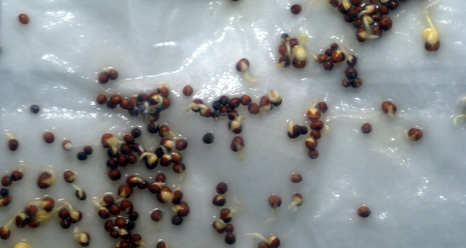 Good luck with your seeds. Hey, Space Zucchini, can you tell us more about the soil you’re growing from? Is it a normal earth-soil, or do you need some supplements added to it? Don’s blog about Zucchini and Broccoli is so informative and fun at the same time. We earth-bound beings totally appreciate Don taking the time and focusing his great writing talent to share with us the Living-in- Space experience. This blog would be amazing even if it wasn’t being typed from space. In fact, you might be making some of us Earth bound wannabe gardeners look bad. 😉 But no–mostly I must say I am inspired to try a little harder with my own plot of land. There’s something sweet and zen and encouraging about the way “Gardener” writes (and Zucchini speaks). This will be one of my favorite posts ever. Ever. Thank you. And keep up the good work. PS- I watched the interview conducted today. I was thinking how dreamy it would be to up in space, in my little place, busily working on this science experiment and that engineering experiment when you verified TWO (and a half!) HOURS of exercise. A DAY. I just *thought* I wanted to be an astronaut!!!!! EEK!!! 9th grader asks, are LactoB and Saccharomyces coming home with you? If Algae can provide fuel, can she also enhance your tea? Can anyone make her flavored red, yellow, orange, and blue, like the springs of Yellowstone? You said gardeners can’t taste anything. Does aroma help at all? Picasso tea has the glorious scent of caramel. With some sugar and milk, does it still taste like yesterday’s coffee? There’s a little tea shop you need to see where the pot has a cozy, the sugar comes in cubes with a silver tongs, and the china isn’t plastic. Long dresses and hats are fine. As are tees and jeans. Me? I wore tees and jeans to Royal Ascot. I wasn’t properly attired, big as a barrel, also no hat. A polite bobbie swapped my camera for a little white card. Three numbers in blue ink. No one made me feel unwelcome and I knew no one either. The white carriages with large, spoked wheels were there, the mourning coats, and the large floral hats. HRH Elizabeth, Queen mother, and no tv between me and Diana. Or I think that was her, I’ll remember her anyway. More hats, oh yes! The royals were on one side of the track, and we were nearby. I remember a gap with some suits standing between carriages and us. I’m asked to stay on my side of the gap. He was nice about it, how should I know? Never been here before. A quick trip to the window with a few pounds, sent me home with a few more pounds in my pocket. We all take the train. Swap your fish bowl for the tall beaver hat. Its Easter parade all over again. Can you smell the roses now? The horses? Afterall, this IS a horse race! OMG! My friend was working under this project! I am really proud! Is there a list somewhere of all the plants that have been in space? 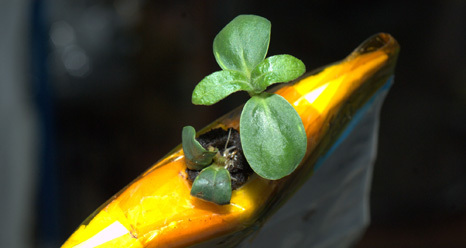 I like growing things on earth, but I have no idea what the challenges are to growing them in space. What are some of the issues you noticed while doing this experiment? 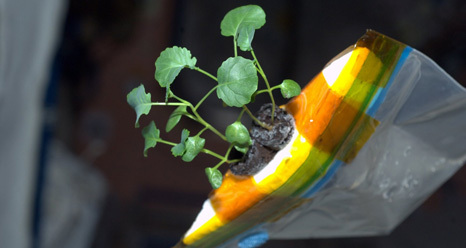 I think it would be interesting to design an “aeroponics for space” growing container. As Ellie gets older, I will be able to pull out your posts and show her how gardening in space is possible – all thanks to you. Love your posts!